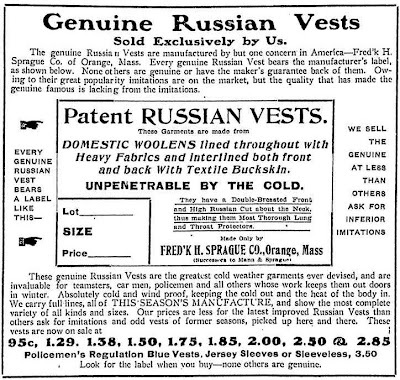 The Frederick H. Sprague Company of Orange, Massachusetts began producing the "Sprague Russian Vest" in 1895. Originally made in wool with a "textile buckskin" interlining for wind resistance, they were later made in a variety of fabrics, including corduroy, broadcloth, frieze, cassimere, kersey and cheviot. Single breasted, sleeved, and women's models were also introduced later on. 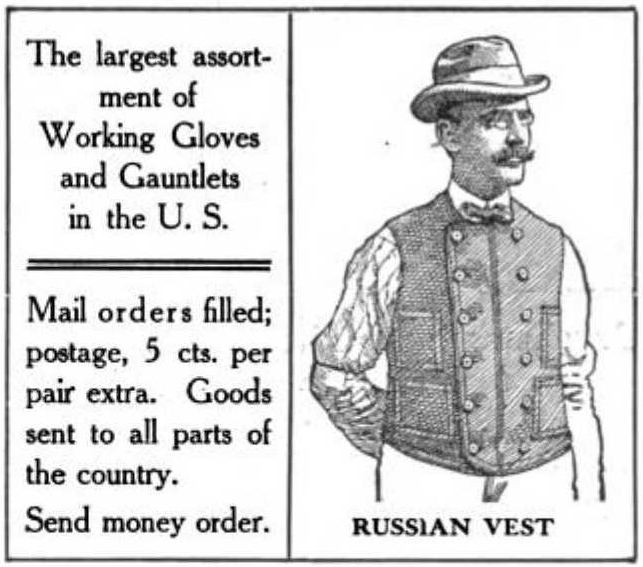 As the popularity of this style grew, the "Russian Vest" name came to be somewhat of a generic term for the style. 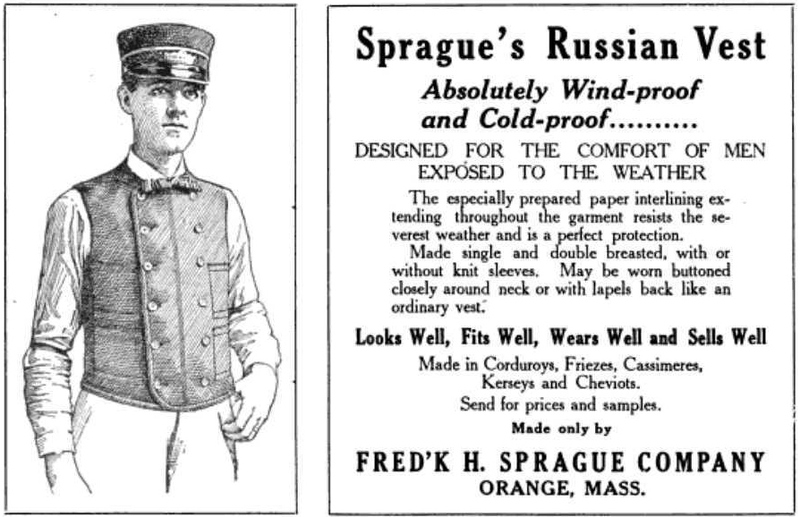 The Fred'k H. Sprague Co. fought back, trademarking the name in late 1905. Other manufacturers switched to the term "storm vest" to describe the style. 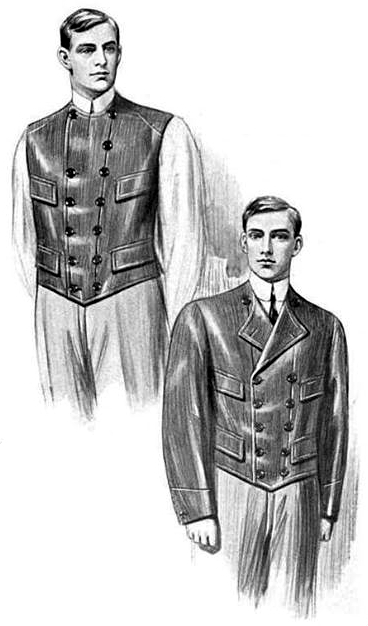 Sprague continued producing this style of vest, virtually unchanged into the mid 1910s. I cannot find ads for it after 1916. There could be several reasons for this: In 1916, Sprague moved their factory to Fitchburg, MA. It seems that after the move, the company focused more on their children's "Alheneeds" and "Alsheneeds" lines, and less on their outdoors and workwear lines. 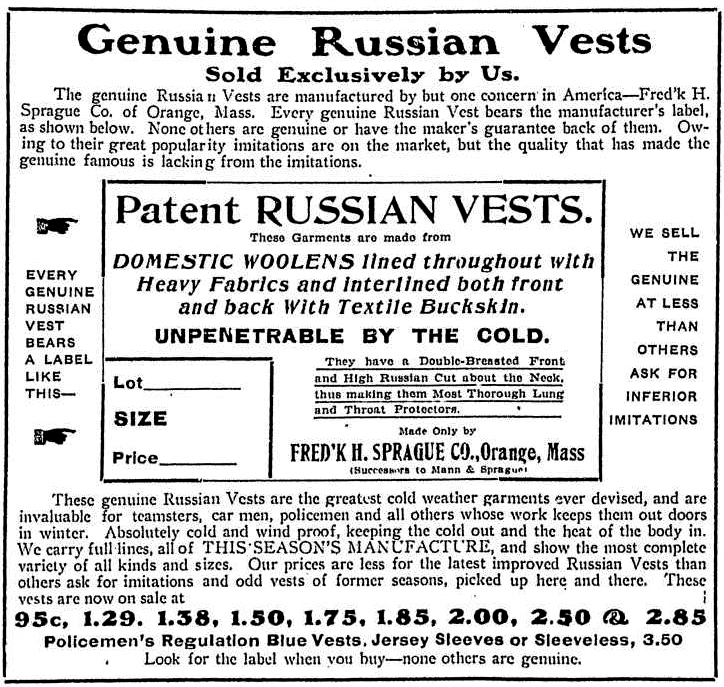 After working for two decades to tie the "Russian" name to their product, the 1917 revolution and following red scare in the United States seems like it would have spelled marketing disaster to their product. The original F.H. 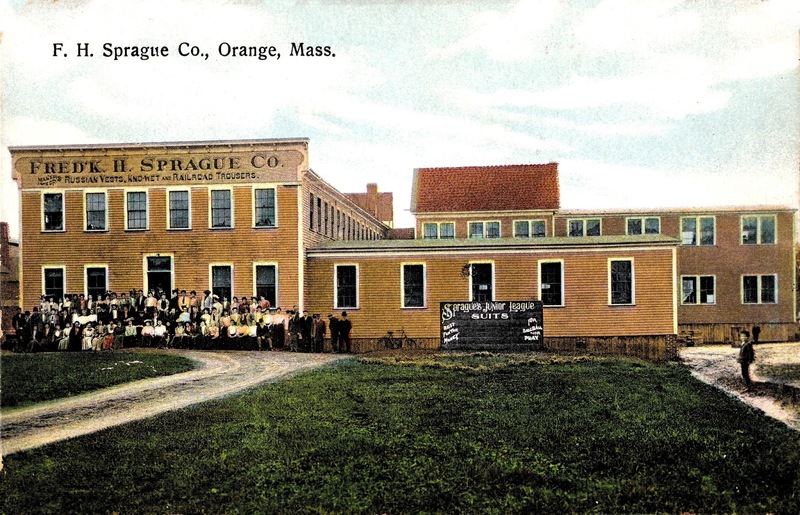 Sprague Co. factory, located at 108 East Main Street, Orange, MA. They also produced Kno-Wet trousers, Railroad Trousers, and Sprague's Junior League Suits. Another photo of the factory, from 1905, can be found here. A sample of the label found inside Sprague's vests. A 1904 ad. Bill Sewall (William Wingate Sewall) was a long time friend of then president Theodore Roosevelt. The two met in the 1870s, when Sewall and Wilmot Dow served as hunting guides for a young Roosevelt. Sewall and Dow later managed Roosevelt's Elkhorn Ranch in the Badlands. More on Sewall and his relationship with Roosevelt can be found here. Ad from 1907, showing the standard sleeveless double breasted model. 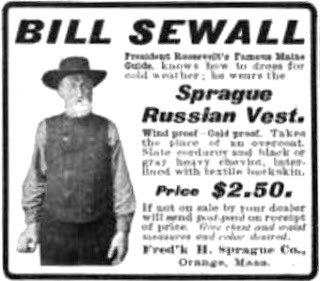 Ad from 1909, targeted at the railroad market. 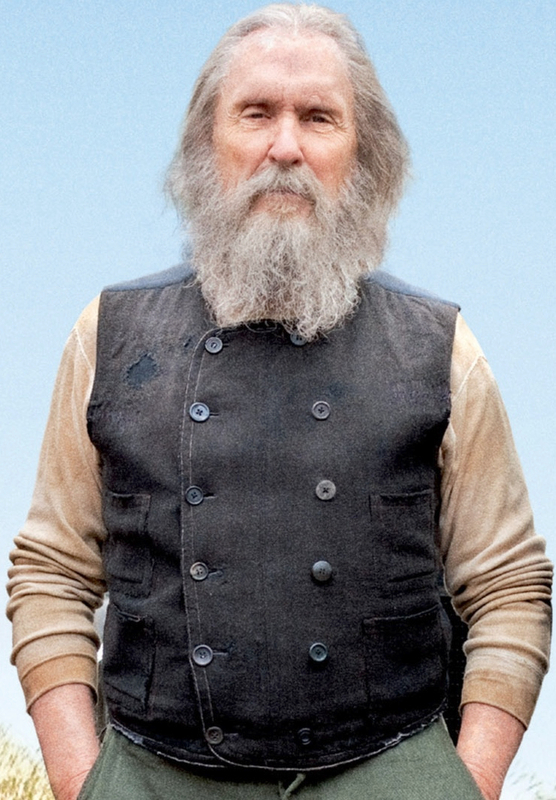 A heavily worn Russian vest makes an appearance in the 2009 film "Get Low", worn by Robert DuVall's character, Felix Bush. 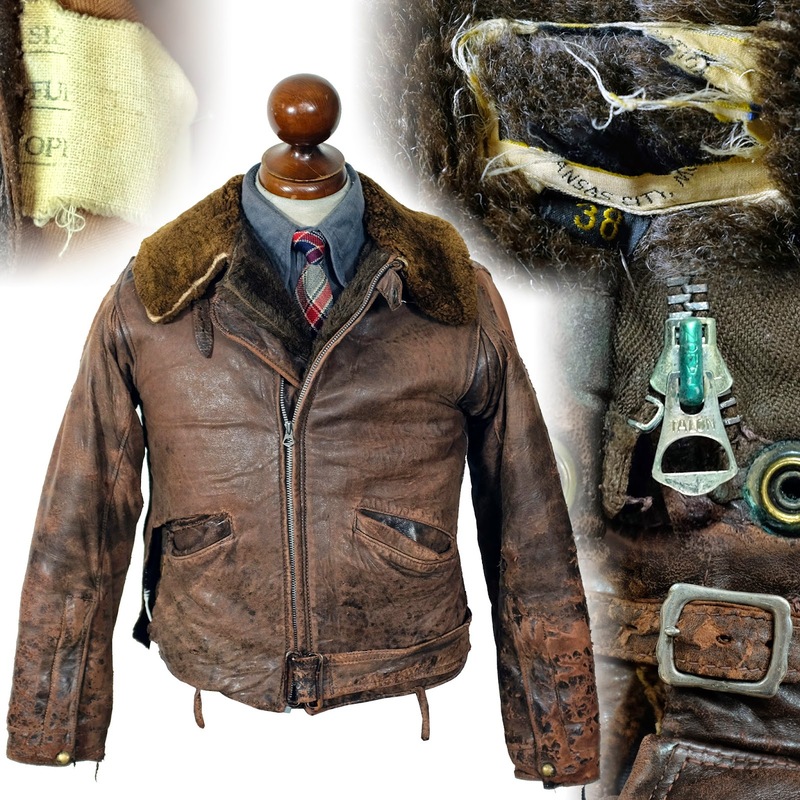 This style was made by other manufacturers in leather, an early ancestor of the modern motorcycle jacket. Like the Sprague's vest, it was available with sleeves, without sleeves, and with or without a collar. It is shown below, in an ad from 1905, with all the options, sleeved and with a collar. Shown as outerwear, the ad copy suggests it should be worn for layering. "Prudence suggests a waistcoat for winter service under a coat of fur, leather of cloth, since in a careless moment one is apt to throw off the outer garment and suffer the penalty. It is a garment of this character that compels one to recognize the superiority of the Danish Leather which is soft and pliable enough to leave a waistcoat without the stiffness and restraint that characterize those in this country."